This yacht was our show yacht for the Southampton International Boat Show, she comes packed with additional features and a 'state of the art' navigation system all set for shorthanded sailing and blue water cruising. She is a three cabin version with an additional skippers berth behind the navigation station. A white hulled version of the T58 built to a specification agreed between the owner and the yard. The owner has visited the yard on a number of occasions during build to confirm changes and to update his specification. There are many extras and the level of customisation is very high. This yacht is destined for blue waters and will be sailed away from the yard upon completion and commissioning. A blue hulled version of the T58 with full teak topsides and teak toe rail with integral stainless steel fairleads. She also comes with custom made davits (S/Steel). Internally she is a three cabin version with walk in engine room and workshop, oval shaped dining area and two armchairs in the opposite half of the saloon. Finished out in green leather and high gloss woodwork and cabinetry this is a wonderful yacht. Standard white hulled version of the T58 with teak decks and the new coachroof. Internally she is a three stateroom version with a walk in engine room. The saloon has a rectangular table and single straight settee opposite. She also supports two heads and separate stall showers. 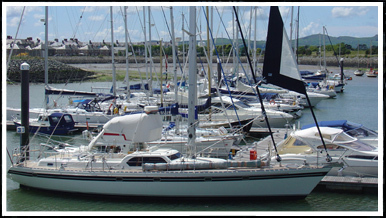 tandard white hulled version of the T58 with teak decks and the new coachroof. Internally she is a three stateroom version with a walk in engine room. The saloon has a rectangular table and single straight settee opposite. She also supports two heads and separate stall showers. Built on Time and shipped to Hong Kong for commissioning. 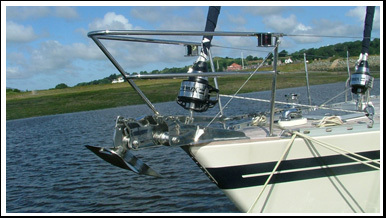 A blue hulled version of the T58 with full teak topsides and teak toe rail with integral stainless steel fairleads. She also comes with custom made davits (S/Steel). Internally she is a three cabin version with walk in engine room and workshop, oval shaped dining area and two armchairs in the opposite half of the saloon. 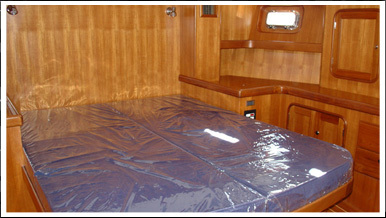 Finished out in leather and high gloss woodwork and cabinetry this is a wonderful yacht. Currently in build, due to be completed in the autumn. The new T54 which achieved the bronze medal for design at the recent Kaohsiung Boat and Leisure Show. The yacht is a blue hulled version with a satin finished interior and cream leather upholstery (which can be changed for the new owner). Finished to an exceptionally high standard and including many extras within the standard build. This yacht has a raised navigation area within the saloon and the Bill Dixon designed hull gives much more space in the aft areas. A standard T48 topsides with stainless steel window surrounds and teak toe rail with integral through fairleads. 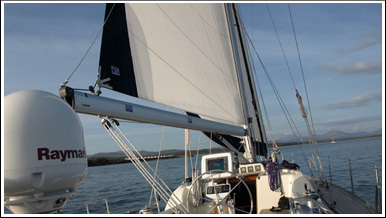 She will be rigged as a Cutter with standard sail plan (Yankee, Staysail and Main with all controls led back to a spacious cockpit. Internally she is a two stateroom version with a forward heads in the bow, this version layout cannot support a bowthruster. She will have a satin finish interior with all the usual refinements. Currently built awaiting final finish based on purchases requirements. 1st updated version of the T64 with new coachroof design and sweeping lines from the deck saloon to the rear of the cockpit and the dual helm stations at the aft. The new design moves the already established yacht into the modern era and combined with the quality interiors and finishes available this is destined to become a much sought after vessel. This yacht is already in build and looks spectacular.